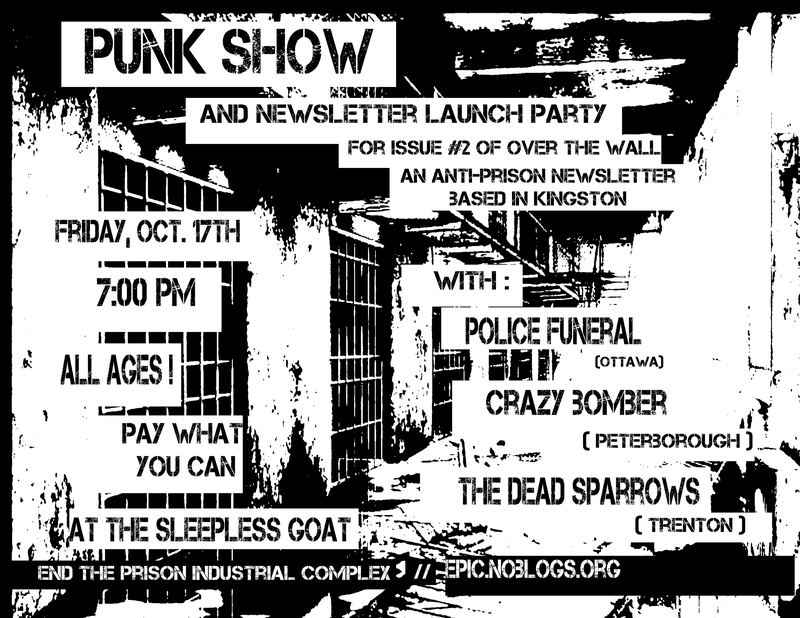 October 17th: Newsletter Launch and Punk Show! Over The Wall is a print newsletter based in Kingston about struggles going on inside or around Ontario prisons. The goal of the project is to share information about what’s going on inside prison walls with supporters and potential supporters on the outside. Our first issue was launched in April 2014 and focused on the prisoner strikes across the country against the pay cuts in federal prisons. We are pleased to announce the release of a second issue which will feature report-backs, statements and analysis from this year’s Prisoners Justice Day. The official launch will take place on Friday, October 17th at the Sleepless Goat from 7pm-11pm and will feature three political punk bands from across the region. This entry was posted in Announcements, Events, Newsletter, PJD. Bookmark the permalink.